RECEIVE A FREE GARAGE DOOR INSULATION QUOTE! 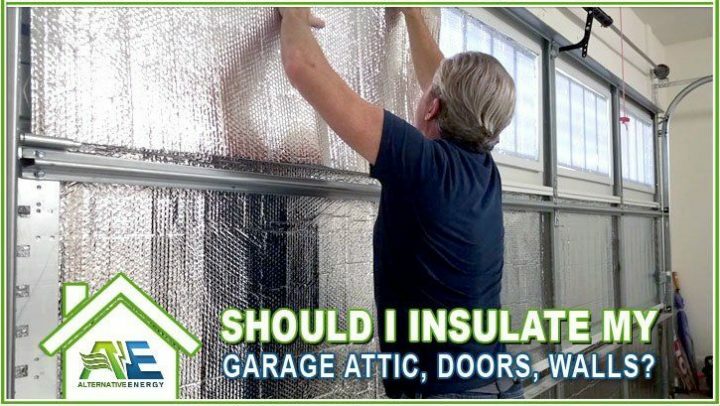 Searching for “Garage Door Insulation Near Me“, garage door radiant barrier, garage wall insulation, or garage ceiling insulation in Phoenix, Mesa, Scottsdale, Tempe, Gilbert, Chandler, Peoria, Surprise or Glendale, Arizona? If so, Alternative Energy, LLC can help! We are professional garage door contractors providing garage door insulation and garage radiant barrier installation services in the Phoenix, Arizona valley! Get your garage door insulation installed today for as low as $100 for a one car garage and $250 for a two car garage. We provide garage door insulation services near you! Not only that, but we can turn your garage into a garage workshop or simply make your garage a cooling efficiency machine by installing our garage mini splits. Call (480) 744-1803 now to speak with an experience garage cooling contractor or fill out our short contact form a free estimate. Garage door insulation is important in Phoenix because that’s where most of the heat in your garage is coming from. Garage doors don’t typically come insulated because most homeowners only use their garage for cars or extra storage space. However, not every homeowner wants to only use their garage for traditional purposes. There are some who would rather use the space as a workshop or office space. Should I Insulate My Garage In Phoenix, Arizona? There are some homeowners out there that would rather use their garage as a workplace in the summer. In Phoenix, it would be almost impossible to work in your garage without some type of cooling mechanism. We can help! Not only do we install garage door insulation but we can also install a garage mini split that will turn your garage into the most comfortable workspace of your dreams! We Install The Best Garage Door Insulation! That’s where Alternative Energy, LLC comes in. We are experts at garage cooling and can help with all 3 aspects of cooling a garage in Phoenix, Arizona: Garage Door Insulation, Garage Attic Radiant Barrier and Garage Air Conditioning. We Can Handle All Garage Cooling Problems! 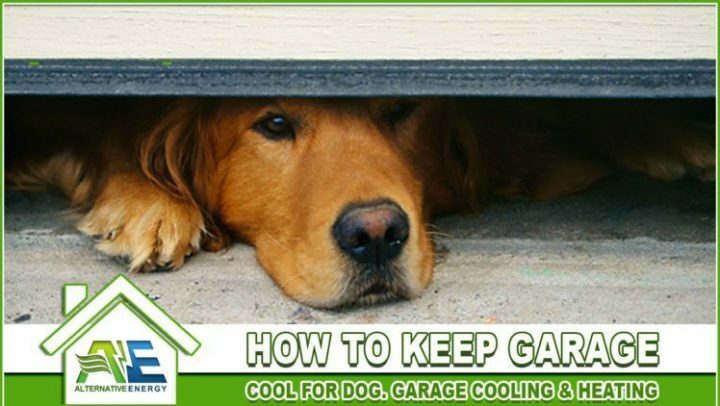 Cooling down a garage in Phoenix can be difficult because most garages aren’t insulated, have a lot of open air pockets, no vents and no form of cooling system. Luckily, the experts at Alternative Energy, LLC can solve every one of those garage cooling problems with our patented energy products. Not only can we insulate your garage door but we can also help with garage radiant barrier and garage mini-split systems. A recent customer reported that “Just installing SRX alone on the garage door decreased the temperature of the garage by 20 degrees. This is before installing the Garage mini system“. As we mentioned in the paragraphs above, adding garage door insulation, also known as garage door radiant barrier, works great but works even better when combined with garage attic radiant barrier. Radiant barrier is a type of reflective insulation that rejects the sunlight from entering your garage altogether. Best Garage Radiant Barrier In The World! We offer a special type of radiant barrier foil called SRX (SuperReflex). 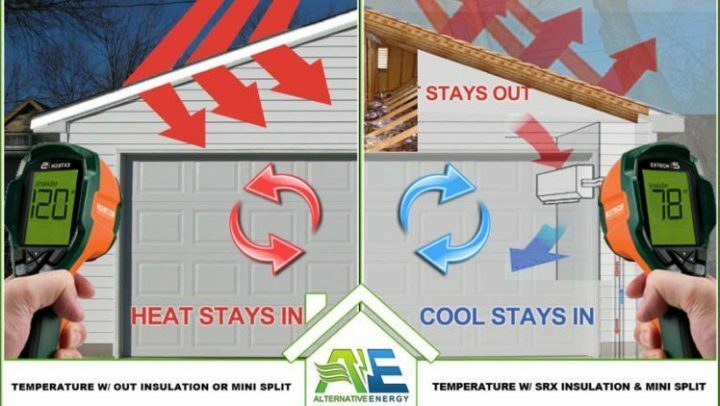 SRX is the best radiant barrier in the world because it works twice as good as any other radiant barrier system, is university tested, has the lowest emissivity rating in the world and comes with a money back guarantee to save your 50% on electricity when installed in your home. Garage air conditioning or garage mini-split systems will cool your space down fast when combined with SRX garage radiant barrier and garage door insulation. 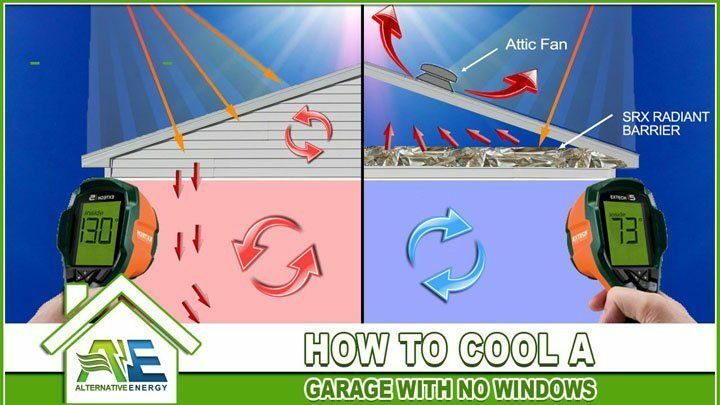 Your garage will be a cooling machine. This is the best way to cool your garage down fast in a sunny place like Arizona. Garage Air Conditioning Is A Must In Arizona! Those who want to cool down a garage in Phoenix will find it to be very difficult without some type of portable ac unit, swamp cooler or garage mini split system. Garage mini-splits are the best way to cool down your garage because they are professionally installed and are made specifically for the type of garage they are being installed in. We Provide Garage Mini Split Installation Services! The only solution to cool your garage in Phoenix or anywhere else in Arizona is to go with a professionally installed garage air conditioning unit like the Mitsubishi garage air conditioner, also known as mini-splits for garages. We install mini split systems in garages all over the Phoenix valley. Give us a call for a free installation quote. This full-service package includes SRX in the garage attic, garage door, and 1-ton mini-split (ac/heat pump combo) system. *Not a window unit *Not a portable unit. *We can also provide garage door insulation only if requested. HOW MUCH DOES GARAGE DOOR INSULATION COST IN PHOENIX ARIZONA? On average, garage door insulation installation costs about $100 for a single car garage and $250 for a double car garage. Schedule your free Garage Door Insulation Quote anywhere in the Phoenix Valley by giving Alternative Energy, LLC a call today at (480) 744-1803 or by filling out our contact form. Our Garage Door Insulation Installation service area encompasses the entire Phoenix Metropolitan Area including: Phoenix, Mesa, Tempe, Scottsdale, Chandler, Gilbert, Fountain Hills, Peoria, Surprise, Sun City, Youngtown, Arizona cities.